Be sure and join me on Facebook for the latest updates on new recipes! I am always on the look out for new lunch foods for my toddler. She is a very picky eater and I would love to have her get the most nutrition possible. These HEALTHY Chicken Nuggets were a winner for both of us! She gobbled them right up! (I may have, too!) These would also be great for a Healthy Superbowl Snack! When I think of Super Bowl foods, I think of fast finger foods that are easy accessible and that people will love…and I think these would be a great option if you are looking for a healthier alternative!For more ideas on Super Bowl Appetizer/Treat Ideas click here! Spray a baking sheet with olive oil spray. Put the olive oil in one bowl and the breadcrumbs, panko and parmesan cheese in another. Season chicken with salt and pepper, then put in the bowl with the olive oil and mix well so the olive oil evenly coats all of the chicken. Put a few chunks of chicken at a time into the breadcrumb mixture to coat, then on the baking sheet. Lightly spray the top with olive oil spray then bake 8 – 10 minutes. Turnover then cook another 4 – 5 minutes or until cooked though. If you make this recipe, snap a photo and hashtag it #chefintraining and/or #chefintrainingblog. I would love to see how these recipes take shape in your kitchens. Um that sounds like a lot of olive oil to use... and they dont come out greasy? Can't wait to try these!! And thanks for reducing the size of your web banner! :) Much better! Mmmm... This picture makes my mouth water! They sure look better that anything I have in my freezer! Your blog makeover looks great! mmm these look yummy!!! thanks for sharing and posting nutrition info! It can be found near the dried bread crumbs at the grocery store. It is very similar, it just provides a different, crispier texture. Yum! these look great! I love chicken nuggets and your recipe looks great!! Do these freeze well? 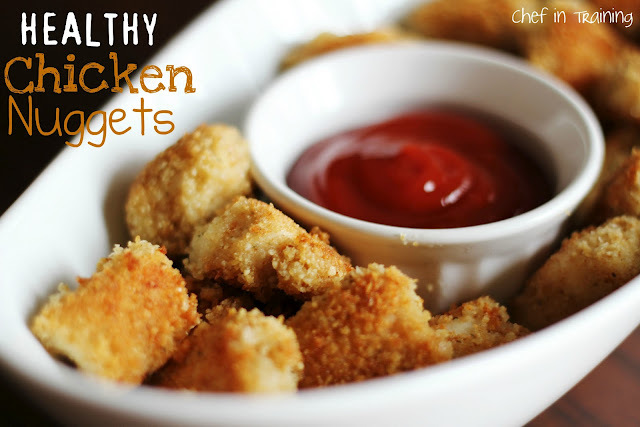 My boys LOVE chicken nuggets & this would be a GREAT healthier version!! I've seen similar things on Pinterest. Yours look yummy, I need to try these! I would love for you to visit my new food blog, The Sweet Spot, and link up your recipes to my Mouthwatering Monday Link Party! not at all. i made these today and they are great! These look so much tastier than the ones in the frozen section! Can't wait to try them for my kids! Just made these! Soooo good. Thank you for this super quick and easy recipe! These were so good! Had them tonight! They will be replacing the other homemade nuggets that I was making which were fried, way worse! :) Thanks! Hey hon can i freeze these babies? they look delish. My son would look these! Made this for dinner tonight and everyone loved it. My 9 y.o. son said it was EPIC! Thanks for such a great tasting nugget recipe. Hello!! My name is Nikki and I am a stay-at-home mom. I am married to the man of my dreams and have a beautiful little girl with a sassy attitude and two handsome little boys whose smiles can brighten anyone’s day! © 2019 Chef in Training. All rights reserved. Privacy/Disclosure.